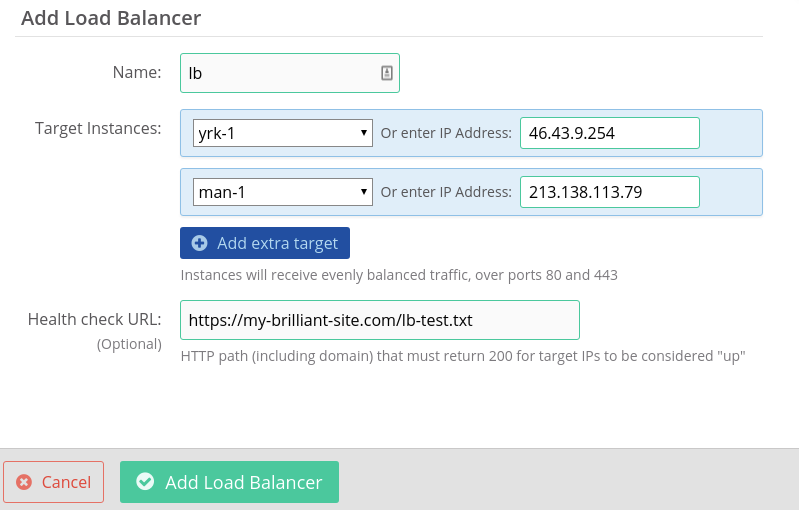 Simple load balancers are configured within the Bytemark Panel, with no code or complicated configuration required. Simply select your target instances (the servers the load balancer will send requests to, and retrieve responses from), point your web traffic at the load balancer and we handle the rest. Load balancers are also available via the Bytemark Cloud API, enabling dynamic on-demand scaling for our advanced users. Separate Database: If your application or website has a database, we recommend you separate the database from the target instances. This ensures the user accessing your application or website has a consistent experience, irrespective of which target instance they hit, as the target instance accesses and stores information in the same central database. Separate Storage: If your application or website needs to access content (such as images), storing them in a centralised place is more efficient than storing separate copies on each target instance ie. so you only need to update a single instance of a file. Containerise: We recommend Docker to make deployment as predictable as possible. It enables you to build new instances from a simple configuration file in a predictable way, making it easier to add an additional target instance when required. WordPress? Magento? Other CMS? Most CMS and open source packages (such as GitLab) have extensive documentation on how to best configure them for scaling via load balancing. We recommend reviewing their documentation and best practice before configuring load balancing in Bytemark Cloud. Go to our ‘Networking’ tab in the Bytemark Panel. Complete the fields, setting a name and selecting which instances (from the drop down menu) or IP addresses should be targeted by the load balancer. To modify a load balancer, click ‘Edit settings’. More options (including additional ports and advanced configuration) are available with our API — please contact product@bytemark.co.uk if you have any queries.